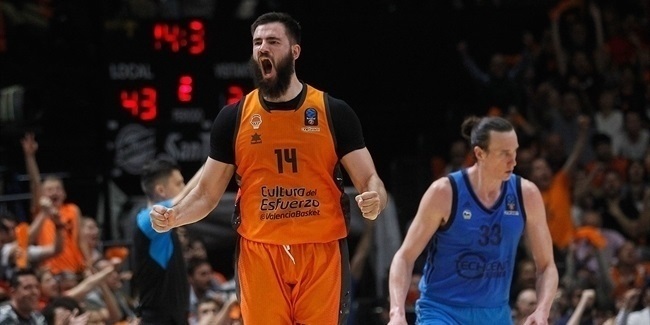 Bojan Dubljevic enhanced his already legendary 7DAYS EuroCup career by playing some of his best basketball to lead Valencia Basket through an undefeated Top 16 stage. Already the competition's career leader in scoring, he moved atop the career rebounding charts, as well, during the Top 16 and flirted with personal bests in scoring, rebounding and assists, too. Dubljevic ranked third in the Top 16 in both total performance index rating and rebounds while lifting his team to the best record in the phase and ensuring it home-court advantage throughout the 7DAYS EuroCup Playoffs. After studying the work of all the candidates, these feats made it easy for Euroleague Basketball to choose Dubljevic as the 7DAYS EuroCup Top 16 MVP. As has been the case for the seven seasons he has worn the Valencia uniform, Dubljevic was the pillar his team leaned on throughout the Top 16, during which he scored 13.2 points on 46.7% three-point shooting, collected 7.3 rebounds and delivered 2.8 assists for an average performance index rating of 19.5. What's more, in the three games Valencia played that were decided by 5 points or less – all of them on the road – Dubljevic raised his level of play to ensure victories. In those games, he was worth 17.0 points on 7-for-10 shooting from behind the arc plus 9.3 rebounds and 3.0 assists for a performance index rating of 25.3 on average. Dubljevic scored in double figures in each of the first five Top 16 games, cooling off only after first place was locked up. He posted a double-double of 12 points and 12 rebounds in less than 23 minute to lift Valencia to a 74-79 road win at Limoges CSP in Round 2. Dubljevic earned Top 16 Round 4 MVP honors after going for 24 points, 8 boards and 5 assists in an 81-82 win at Crvena Zvezda mts Belgrade. In the game that locked up first place, Dubljevic authored the go-ahead basket among his 15 points and 8 boards in a 69-72 comeback victory at Unicaja Malaga. 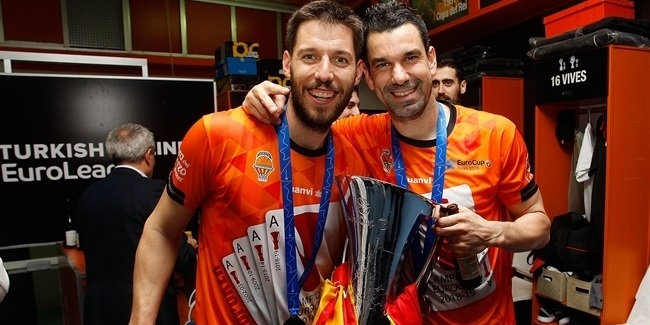 The Top 16 MVP trophy is the latest in an incomparable haul that Dubljevic has achieved since he debuted in the competition in 2010 with Buducnost Podgorica. 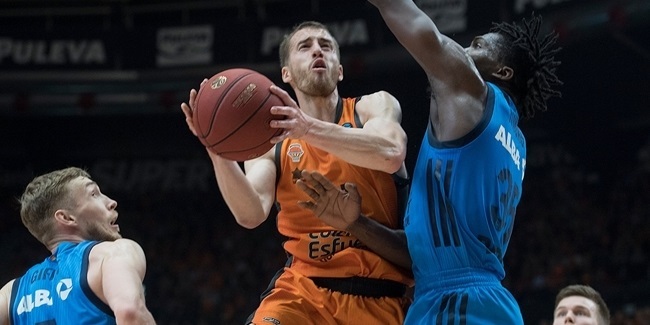 He won the 2014 EuroCup with Valencia and captured the EuroCup Rising Star Trophy in back-to-back seasons starting in 2013. Dubljevic is joined by Kyle Kuric, who was the 7DAYS EuroCup Top 16 MVP last season, as the only three-time All-EuroCup Team selections to date. Dubljevic's 1,392 points, 220 offensive rebounds, 613 rebounds and 1,600 PIR are all records in the competition. And, as he showed with his play in the Top 16 and the trophy he will collect for it, the 27-year-old Dubljevic is far from done compiling big numbers and hardware.